Sad news! The Fairview B&B closed at the end of February. Check out my guide to planning an Austin Bachelorette Party instead. My first visit to Austin, Texas was about seven years ago. I stayed on the up and coming South Congress strip and loved every bit of the Austin vibe. Last week I returned to Austin for a dear friend’s bachelorette party and added on a night for to do some exploring on my own and relax before a long weekend. 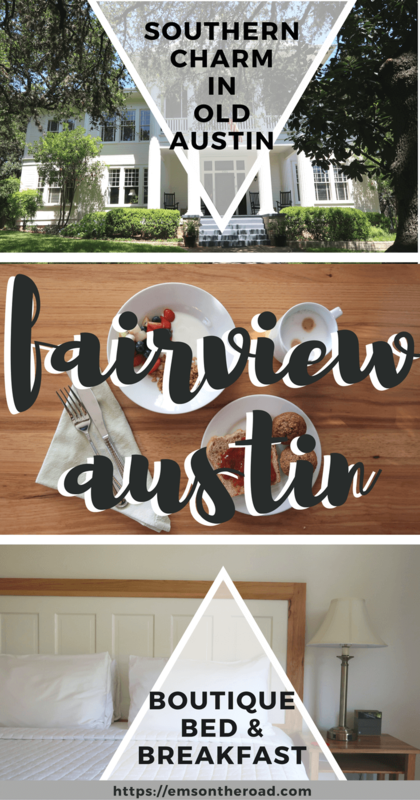 I discovered The Fairview Austin Bed and Breakfast while researching places to stay and found it was an ideal mix of historic Southern architecture and hospitality with modern comforts. The Fairview Bed & Breakfast is located in the historic Travis Heights neighborhood in Austin which is situated just south of Downtown. It's an early twentieth century neighborhood that is very old Austin. With mansions and bungalows winding around several beautiful city parks and so close to all of the fun of South Congress Avenue, this neighborhood is the perfect location for a getaway. If the weather cooperates, take a long stroll around the neighborhood to see a variety of architectural styles and some classic vintage cars. Walk a few blocks to South Congress for all the shopping, eating, and drinking you can handle. Some of my favorite spots are Hotel San Jose's lounge for frosé, tacos at Torchy’s, and antiques at Uncommon Goods. This is an ideal location if you want to be close to things to do and restaurants without having to stay in a busy part of town. Formerly known as The Gullet House, the B&B was built in 1910 and was a family home for several decades. During the 60s and 70s the house was split up into several apartments and in 1989 the house was purchased by a couple with plans to return it to its original layout. After a couple owners and two major renovations, the current owners, Vivian and Jimi Ballard, reopened The Fairview in 2014. After breakfast, Jimi and I discussed the history of the house as he pointed out little details that might have gone unnoticed. Historic houses that have gone through several transitions are often gutted on the interior but The Fairview was lucky to retain all of its original trim, wainscoting, and beadboard. The most amazing detail that was left untouched are the original pocket doors on the main floor. They’re huge single pocket doors which is very unusual. He also pointed out where you can see the old apartment numbers on the different rooms downstairs. Check in is a breeze at The Fairview. Prior to your arrival, you'll receive your code to the doors and your room so you can drop by whenever you arrive. With 6 luxury rooms including three suites, The Fairview is more boutique hotel than your traditional bed and breakfast. I'm all about the amenities when it comes to choosing one property over another and The Fairview offers quite a few. My top three being free wifi, free parking, and a fabulous continental breakfast. Each morning you’ll find a smorgasbord of homemade everything. Bread, jam, muffins, yogurt, granola, fresh fruit, and hard boiled eggs. And all gluten free. The Ballards are gluten free and have perfected their bread recipes, so much so that they decided to prepare all gluten free breakfasts for the inn. Honestly, I had no idea until they mentioned it that morning. The muffins were my favorite item on the buffet and flavors rotate depending on what Vivian is inspired to create. I had quite a few chai spiced paleo muffins. They also provide fresh squeezed orange juice, hot tea, and unlimited sparkling water (Austin is obsessed with Topo Chico). As a self proclaimed soda water addict, this was indeed a highlight. The Ballards are big coffee drinkers so there are several options to get your caffeine fix at any time of day. They're enormous coffee machine may look intimidating but don't worry, it makes drip, espresso, cappuccino, and lattes with the press of a button. There is even a warming drawer for the mugs! *Note the coffee and sparkling water are available in the kitchen all day long. The best part of breakfast though is it lasts until 11am! So you can sleep in and get your grub on before heading out for the day. The house is setback on grounds full of mature oak trees so it really feels like a retreat. Note *GPS doesn’t locate the house properly so just keep a lookout when you’re driving or in your cab. The front is a great little spot to read if you can bear the summer temps. In the fall I imagine I could rock the day away out there. The back porch is situated in the garden and is a great place to have breakfast. The living room is just off the back porch and is furnished with some comfortable sofas next to the fireplace and by the large front windows are two lounge chairs surrounded by full book cases that are free for guests to use. I would love to camp out here for a week or so in the fall or winter. Endless coffee and books by the fire? Sounds pretty perfect to me. The Fairview is a very unique B&B. It is simple, bright, modern, and comfortable. No doilies or lace curtains here. The high ceilings and huge windows in the Redbud Room were so unexpected and made the space feel so dreamy. I had a wonderful view of their garden thanks to the huge windows and natural light flooded the room for hours. The bed was a modern king size with an organic mattress, fine Sferra cotton linens, and SmartSilk silk filled pillows & comforters. I slept like a baby surrounded by all of those pillows. My favorite decorative touch in the room was the headboard made from an old door that framed the sleek, modern king size bed perfectly and married the mix of old and new found throughout the house. Each room has their own thermostat which is freaking game changing. If you’ve been to Austin in the summer you know it is hot as hell, even to me. As a South Georgia native, I was sweating as soon as I stepped outside. The afternoon I arrived, I walked (silly me) to meet some friends at Torchey’s for some tacos on South Congress and thoroughly relished cranking the AC when I returned to my room. Each room is equipped with a big bottle of filtered water infused with a sprig of organic mint from the garden by the bedside to help you rehydrate after going out. All of the rooms have a private ensuite bathroom with a luxurious tub and Texas made bath products from Dear Clark. The bathroom also comes with a hairdryer and makeup remover wipes. I rarely use either of those things but it’s nice to know they were there in case. Rooms begin at $199 per night at The Fairview which is comparable to other hotels in the area. But for this location plus all of the amenities that are included, this B&B is a great value. The old south meets the new in perfect synergy at The Fairview Austin. I truly can't wait to come back. Ready to book your trip to Austin? Check availability at The Fairview Austin.